← Would you walk here? I realise this is probably as easy as shooting fish in a barrel, but the recent Daily Mail article about furious lawbreakers furious that they had been caught breaking the law (Mail translation – hard-working families hit by evil stealth tax) was too impossible to resist. Yes, it’s the Daily Mail article about a bus gate that’s actually a ‘money making scam’, or some such. Helpfully, the Mail themselves provide a diagram of the situation in the article, which shows that drivers will only face a ‘two mile round trip’ if they actually drive all the way up to the bus gate, realise they can’t progress through, and then have to drive all the way back the way they came. 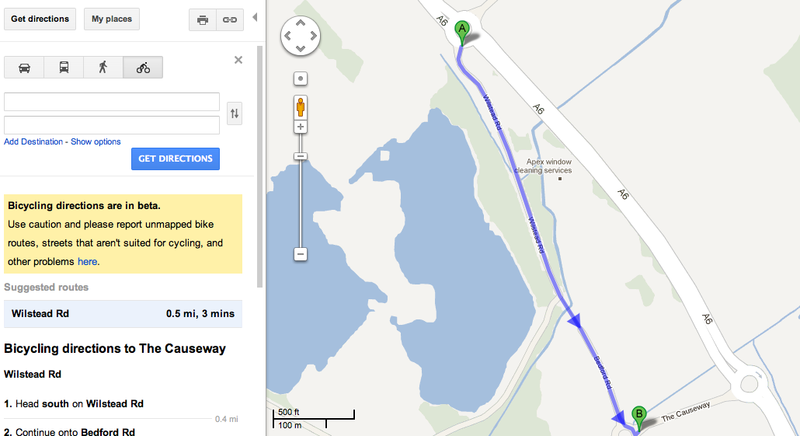 The bus gate is at the approximate location of the left arrow. As is immediately clear, using the ‘proper route’ – as the Mail itself describes it – involves little extra distance, and is almost certainly quicker than the ‘shortcut’, given that it is a national speed limit dual carriageway, rather than a single carriageway country lane with a 40 mph limit. the only possible way drivers could end up taking a ‘2 mile round trip’ is if they drove around one of the roundabouts thirty times, and then got lost. Gibberish. We haven’t even got into the article yet, and there’s more nonsense. The bus lane has not just been ‘marked up’ by the council; it’s been there since (at least) 2009, according to Streetview. In other words, the bus gate predates the estate. The signs are quite clear to understand for anyone who’s recently sat their theory test, or who actually bothers to remember the rules. ‘No motor vehicles’. Sweet Jesus. The bus lane hasn’t been ‘created’ or ‘narrowed’, it’s always been there, and it’s always been illegal to drive through it. 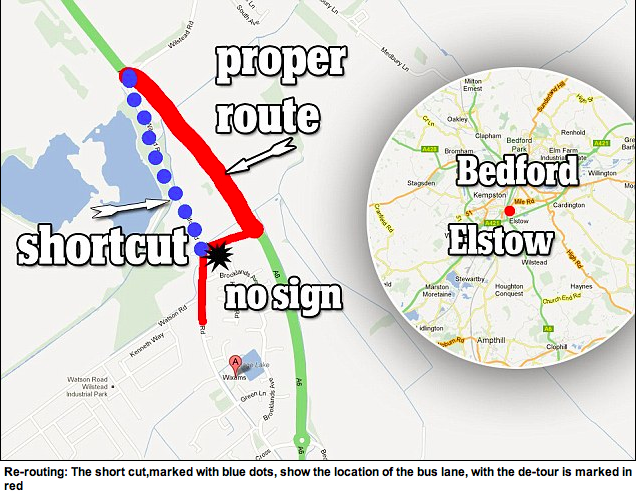 Nobody is ‘forced’ to make a detour, let alone a bogus ‘2 mile’ one; they just need to drive on the dual carriageway, which will be a faster route to their destination in any case. All that has changed is that the council are now fining people for doing something illegal. The article starts with a repetition of the same nonsense. Residents on a housing estate have been left facing a two-mile detour to get home after a council installed a 10-metre bus lane next to a junction. 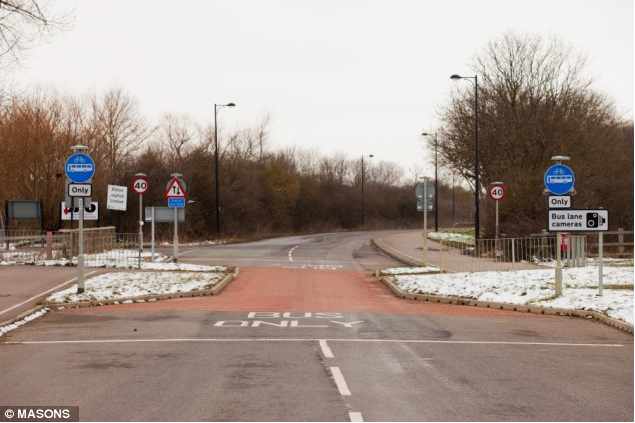 People living on Wixams estate, outside Bedford, now have to drive along the busy A6 to avoid the 32ft lane that is used by just two buses an hour at peak time. No, no, no and no. NO! Nearly 300 drivers been fined since the road was fitted with cameras and marked ‘Bus Only’ two weeks ago. 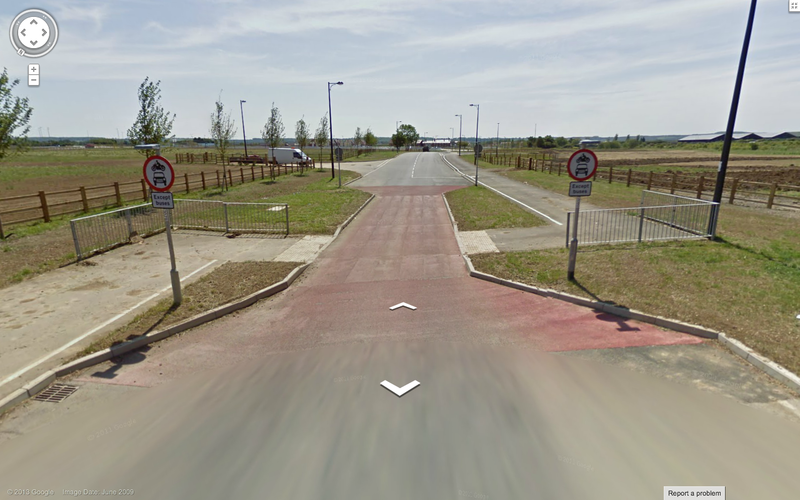 As you can see from the 2009 Streetview image, this bus gate has always been marked as ‘no motor vehicles’. People have been breaking the law with impunity; all that has changed is that they are now being caught. The lane has been created in the middle of Kingsway road cutting off the access to the estate. Not ‘created’, not ‘cutting off access’. 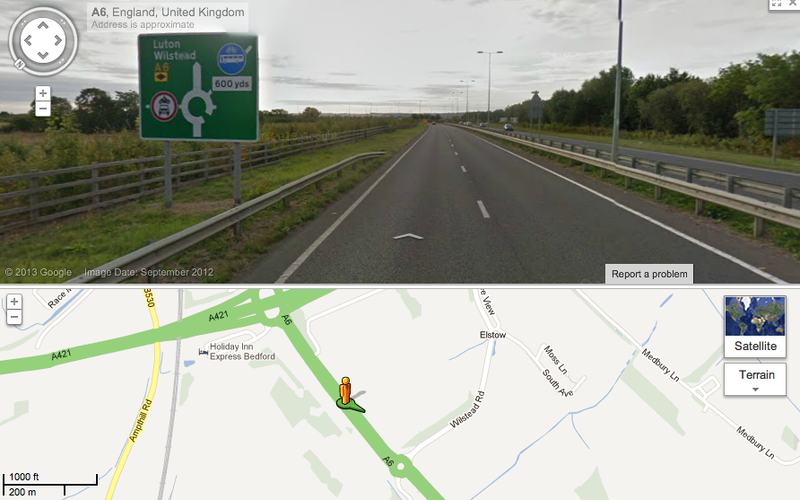 There’s a big dual carriageway right next to it, that is faster! People living nearby say the lane is nothing more than a money-making scam by Bedford Borough Council which has fined 284 drivers in the past two weeks. It’s only a ‘money-making scam’ if you fail to obey signs, of which there are MANY. That’s BUS ONLY painted on the road, in both directions, BUS AND CYCLE ONLY signs on both sides of the gate, AND a warning that cameras are operating. Anyone who drives through this arrangement, and then has temerity to complain that they got fined, really shouldn’t be driving, it’s as simple as that. They are effectively admitting they are driving without due care and attention. Katie, you are an idiot. There are signs saying ‘bus only’, yet you still drove through, and are now complaining about it? Amazing! If you don’t want the council to take your money, don’t drive through it! What is so hard to understand here? Mrs Jepps also seems happy to state in a national newspaper that ‘it makes sense’ to drive half a mile on a 40 mph road, instead of driving a fraction further on a 70 mph dual carriageway. Mark O’Leary, 26, has been a resident on Wixams estate for 2.5 years and says that although the lane has been narrow for the duration of his residency, the cameras have shortened fuses in the area. ‘It has always been a bus lane, the only new addition is the actual camera which has gone up in the past few months and the camera sign which has been there for a couple of days. From this we can gather it’s not the bus gate that’s the problem – which Mr O’Leary confirms has existed since he has lived on the estate – it’s the fact people are now being caught using it. The only remaining issue is the apparent lack of signs warning people. And heading north from the estate. Maybe people don’t understand what these signs mean, but frankly that is their problem. They should know. And there is certainly no excuse for driving through the bus gate, if you did mistakenly end up driving down the lane. Ah that’s made my day 🙂 Remember it’s not a “stealth tax” is a stupidity charge…..like all motoring fines! There was a similar instance recently here in Somerset. A narrow bridge which had always been width restricted was being damaged by people taking larger SUVs and vans across. So the council put up steel bollards, seven feet apart. Lo and behold, the local paper (the Weston Mercury) was full of how it was disgusting and they were causing damage to people’s vehicles… Hmm, it seems they would only damage your vehicle if it was too wide to be legally going across there anyway. It’s kind of reassuring to see that it’s up to its old tricks, though. Only a matter of time before a piece on road tax, I reckon. Typical DM article. I am sure that many of these same people would be the first to complain about anti social behaviour, drunkeness etc. Apparently though, it is not regarded as a crime to break the law in respect of motoring! A Daily Mail article consisting of nothing but lies and nonsense – that’s not news. In 1906 the Daily Mail commissioned an article from a retired general & a novelist about an imagined German invasion of England. As C Moran reports in his book ‘Classified’: “Striving for realism, Le Quex & Roberts, spent four months touring southern England by motor car to determine the most likely path of invasion. Their assiduousness was in vain. [Daily Mail proprietor] Northcliffe objected to the German army’s invasion route on the grounds that it went through areas where the Daily Mail’s readership was small. Consequently, Le Quex was forced to devise a new line of march, one where newspaper sales took precedence over accuracy!” The inter-war years saw the Mail involved in the Zinoviev Letter fraud and support for Hitler; nowadays it’s daily lies over immigration and climate change. Twisting the facts about a bus lane will not cause these scum any sleepless nights. Brilliant teardown of a piece of nonsense. all this “stealth tax” and it’s legalised thievery astounds me. The perfect analogy is if the DM ran a story about a shop which has recently installed CCTV to catch shoplifters and then fined them. Would you then get hundreds of comments saying rubbish about taxes on shoplifters, breaching shoplifters human rights etc etc. Brilliant. After yet another cold ride home this evening, that was just what I needed to cheer me up. Never underestimate people’s stupidity – or the DM’s ability to not let facts get in the way of a good story. This reminds me of my favourite youtube clip ever. The one of people tailgating buses in Manchester along the bus only lanes only to have a retractable bollard thrust upwards into the unside of their vehicle. The particular one of ‘White Van Man without seatbelt’ who bullseyes the windscreen still makes me properly LOL to this day. Idiots the lot of ’em! Isn’t there a news item where the following vehicle was actually an unmarked police vehicle, whose occupants had to wait several very embarrassing hours before the tow truck came to take it away. Your post aside, which is very good as always, just noting that linking to the original DM article *can* increase their earnings. Daily Mail Online is the biggest newspaper site in the UK earning £45 million a year. I don’t know *exactly* how they earn money, but linking to them will help them to do so. Like many newspapers, they rely on creating controversy to get people to click into their site. In some respect, by linking to them here, you’ve done exactly what they wanted, whether you agree with them or not. Very few people here will actually buy the newspaper (or nod sagely whilst reading! ), so you aren’t actually putting people off. Some people that follow the people here, may just click on an advert on their site. And that definitely gives them money. Even just seeing the advert on a site this big may just give them money. I’ve always favoured sceencapping the article. In the “for review” sections of the relevant copywrite laws this is allowed, I believe. Thus far there have been 19 clicks through to the DM site from here. I do take your point, but I think you might be overestimating the influence of this blog on the DM’s income! Maybe the residents of Wixam estate should offered a retractable bollard system instead? But only provided it includes a webcam so we can all enjoy watching them being impaled on it! Whilst we are on the facts, its worthwhile noting the context of this scheme. The Wixams will, once built, be a huge development – in excess of 4000 homes plus employment. 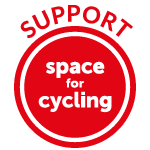 This link – the old A6 before the new dual carriageway was built by the developer – will act as the main bus link between the development and Bedford, with frequent bus services running between the development and Bedford. In fact, it is already used by two bus services per hour in each direction. This is not to mention the fact that this bus gate was actually installed by the developer at zero cost to the taxpayer. So apart from all that, and everything mentioned in this excellent post, both the Daily Mail and the Bedfordshire on Sunday are spot on. Ah, well spotted. I even see that the Daily Mail have recycled a comment originally left under that Bedfordshire News article as an opinion from a local resident in their piece! It’s pretty shameless – I wonder how they get away with it? My guess would be that the road was built specifically to service residential and commercial developments which were envisaged for the site but which could be some time coming. No doubt it was much simpler to build the road with the bus gate in place ab initio, than to obtain a Traffic Order at a later date to impose a restriction. Changing the status of the road later would no doubt run into stiff opposition and possibly get voted down by the local authority. Making it a restricted access from the start, but turning a blind eye to infringers until it begins to matter, was probably easier than bidding to impose a restriction later. ‘Katie you are an idiot’. Oooh I laughed my little socks off. Never has ‘shooting a fish in a barrel’ entertained me quite this much. Thanks for this post! If you want some more on the Daily Mail’s history, remember their headline “Three Cheers for Mosley!” in the 1930s. However – there is always a however – Peter Hitchens of the Mail on Sunday is very sound on cars. 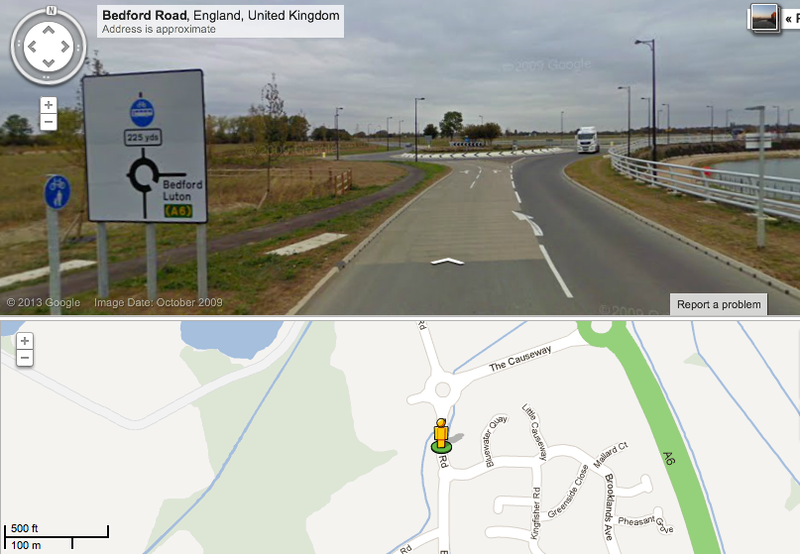 BTW (always a BTW) on the subject of obvious signing I am one of those few people who remarks that speed cameras (another DM bugbear) are also very well signed and are painted in bright yellow, as well as being easily detectable on Satnavs and websites. I think you have to be pretty dozy to get caught, or else just plumb arrogant. My view is that they shouldn’t be signed at all, but concealed. I quite agree on concealing speed cameras. I have no idea how catching people who break the law, without them knowing about it, violates their civil rights or whatnot. If you speed, no matter where and when, you are breaking the law and should expect to be brought to account for it… (though i wouldn’t be against leaving dummy signposted cameras around the place). Two things worry me about this: 1) Drivers are so bad/stupid that they will speed past a camera painted bright yellow + signed & not understand why they have been fined. 2) People believe what they read in the Daily Mail. Number one explains why the roads are dangerous, and number two is worrying on so many levels! 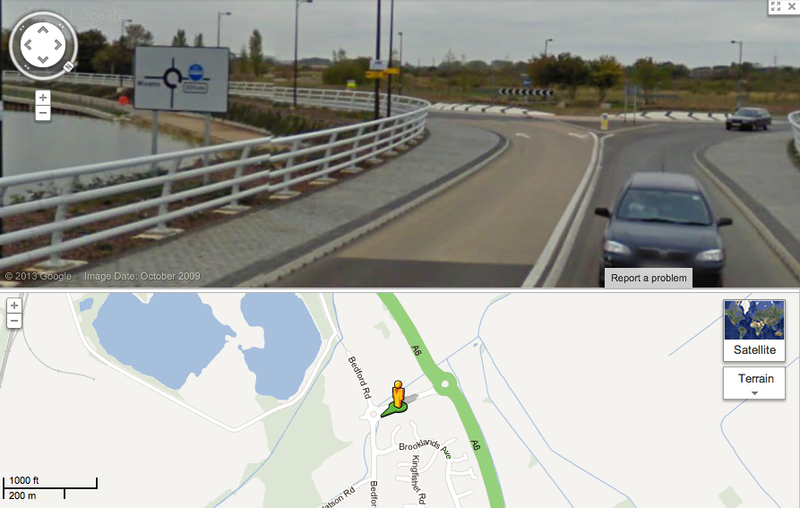 Near me there’s a road with both double-yellows and a mandatory cycle lane. Drivers frequently stop there, and apparently the official Civil Enforcement Officer policy (on the rare occasion that they happen to be around) is to politely ask the driver to move and THEN give them five minutes. As with the speed cameras, I know of no other type of offence where those committing the offence DEMAND a warning that they are about to be caught doing so, so that they can (temporarily) stop doing whatever-it-is and therefore evade any penalty. I must agree with the consensus here that anyone driving through this bus gate is really too stupid to be driving at all. Why don’t they create a “bussluis” (bus lock)? No normal car can pass and it’s cheap to build. That is literally a death trap, but I quite like it (against my better judgement)! Here’s another Dutch one, near Kloosterveen, outside Assen. Lots of people look to have been caught out by this one! tellin’ yeah, retractable bollards are the way forward. Comply, or lose your front teeth. This afternoon in Birmingham on a short section of bus and cycle only road in the city centre, clearly marked, they had Police at either end preventing motorists entering. At work in the past I have come across motorists who believe that it is their right to drive through bus stations. I am sure that they would not be happy if we went across their garden. I’m often surprised by the number of drivers who drive into my local park, manoeuvring around the kids trying to play and the dog walkers. They cruise down the paths and sometimes they pull over onto the grass to stop and have a picnic. It’s a park! The staff complain that they can’t leave the padlocked bollards in all the time because legitimate visitors sometimes need access (and possibly emergency vehicles). I don’t think it helps that the local PCSOs cruise around in their patrol cars. Admittedly they cover a number of parks and have to travel between them, but they could easily get out and walk or cycle once in the park, like actual park wardens. I’ve even heard of people rat-running from one end of the park to the other – almost half a mile – to avoid the traffic queues along the road but I can’t say I’ve seen that myself. I think I’ve worked out where the “two miles” comes from. 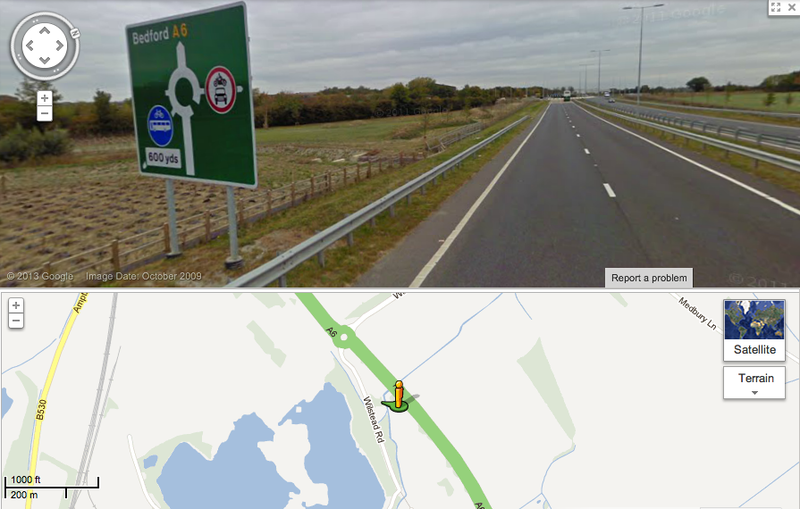 If you start from one side of the restriction and want to drive to the other side, you end up travelling the whole length of the shortcut and the same distance again on the A6, for a total of one mile. Then if you want to go back again (maybe you found there wasn’t anything interesting on the other side), that’s another mile, and hence a “two mile round-trip”. Quite why you’d be doing this “to get home” is, I’m afraid, still beyond me. Just watched (and complained about) Wednesday night’s BBC Panorama titled “Traffic Fines – Highway Robbery” which featured a bus lane like this (if not this one?). IMHO the presenter just made himself look foolish by parroting this Daily Mail take on the featured bus lane, without any context.